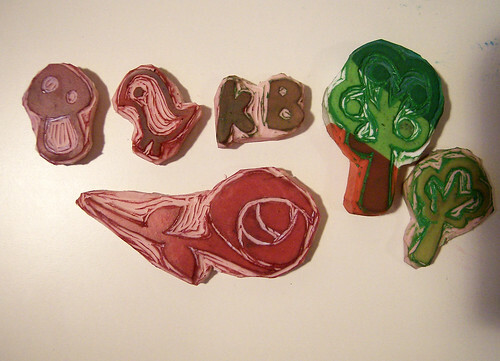 Yes, that's right - I was on a roll tonight and made another six stamps! I decided to make some simpler designs, just to practice. I didn't want to start something huge and then be disappointed if it didn't work out right. Also, some of the lovely Craftster ladies suggested I join an upcoming stamp swap, and I if I do decide to join I want to be sure I can make something I feel OK about swapping... Gotta hate that "swap anxiety", right? 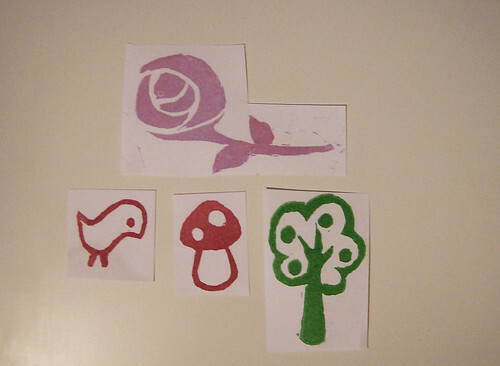 Anyway, I made a rose, a toadstool, a little bird, some trees, and also a stamp with my initials, KB. 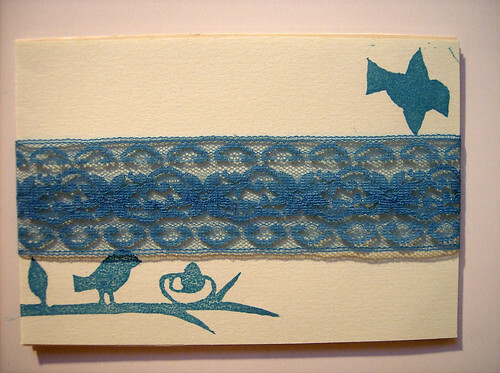 I'm not sure what I'm going to use them for yet, so I just tried them out on some paper scraps. I really love grace's idea about making my own gift wrap, I think the toadstool print could work really well on a Christmas present, wrapped with some burgundy ribbon. 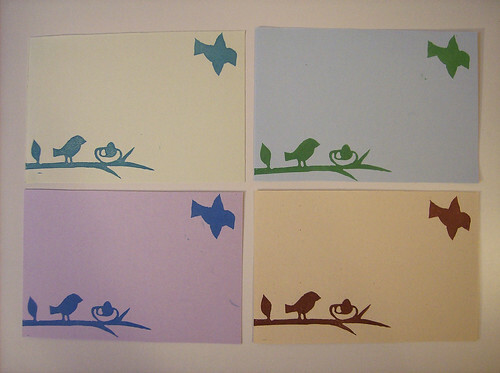 I also got a few new ink pads, and made some more birdie notecards, trying a few different color combinations. Which one do you like best? I have really been neglecting my schoolwork this past week, so you might not hear from me for a couple of days as I struggle to catch up on my reading. I'm going to have to take a break from rubber stamping anyway, before I carve up every eraser in the house... My speedy-stamp block is half finished, and as you can see from the tree stamp in the second pic I'm already looking for alternatives... It's such a hassle ordering new blocks from Ebay, but I'm sure I could never find proper carving blocks in Swedish stores. Living in a small country has its downsides sometimes! Have a great week everyone, I'll be back soon with more craftyness! You should look into selling these online too!! Nice! :) i want to make more stamps now.. Cute! I thought that the 3rd picture (the one with 4 notecards) was a grouping of canvas wall art. The notecards look great but you should it on canvas as well, because I think that would look really cool!